This is my third and final post on home décor. Previously, I talked about utilizing space and surface tops. As I’m sure you’ve noticed by now, I’m no expert. I do what I like and focus on what I think looks pretty and what seems practical to me, and then I share it with you. I’ve enjoyed this little mini series! I think I might do more similar things! But not until I complete this one. We’ve covered the floor plan and decorating desk tops, so what’s left? Decorating the walls! 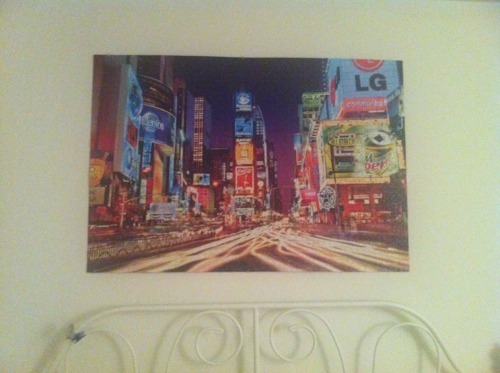 My walls are not very exciting. I feel like the most important thing about walls is the colors, and I haven’t painted mine. That will have to be a future post. So I will keep this post short and sweet. I have three things that I think everyone needs. Growing up, we had family photos hanging up everywhere. The first hall when you walked in had a school photo of each of us kids (which maxed with our senior portraits, so they started to look a little dated) around a group photo of the whole family dressed in denim from when we were all pretty little. If you took a left, the entire main hallway was full of framed photos hanging up. I feel like every time I walked down the hall I found a photo I didn’t know was there. I remember a few of them very clearly … like the one of my cousin and I in our diapers and our matching “Sun Your Bunnies” shirts or the one of my grandma, my mom and I all all dressed in red. (Maybe Mom’s reading this and could figure out how to scan those photos and send them to me and I can share them!) Any way, I couldn’t picture a hallway that wasn’t wall papered with photos! So that was really important to me in my first apartment with a legitimate hallway. I don’t have a family of my own, but I do have a boyfriend and an epic trip to Disney World. 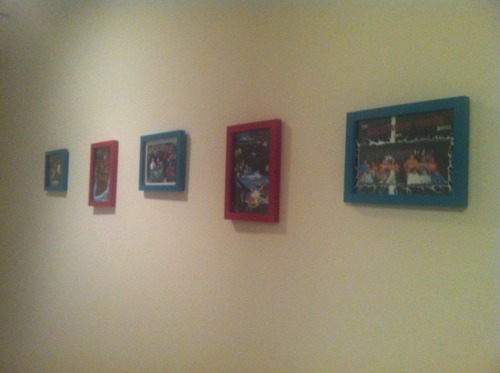 So our hallway is full of Disney ride pictures! Which I love! Er? Or is that just me? I stinkin’ LOVE puzzles. I love putting them together, and I love that after you glue them, you just got yourself a really cool new piece of art for your wall! 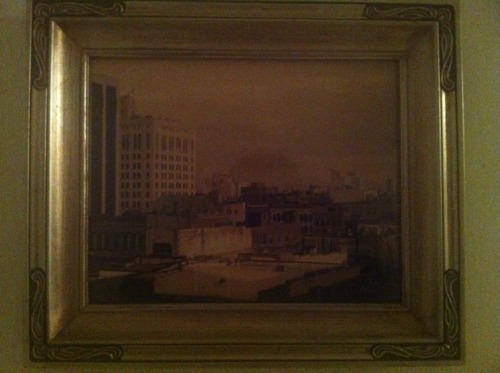 For a while, I exclusively did skyline puzzles, glued them and hung them in my old bedroom at my last apartment. I branched out a little bit, and I don’t hang up all of my puzzles anymore, but I definitely still have one on display. Surfaces are one of the easiest parts of my apartment to decorate, which is why I struggle with them the most. Countertops, tabletops, windowsills, bookshelves — there are so many surface tops in my apartment that are screaming to be decorated and it’s so easy to just keep putting stuff on them! My problem is not finding things to decorate with, my problem is ending up clutter everywhere! It was brought to my attention at work the other day that I may in fact be a hoarder. I also seem to think that the crap that I keep collecting doubles as decorations. In my previous life (and my high school bedroom as it currently exists in Rochester, IL), you would find shelves covered with Beanie Babies, decorated Frappuccino bottles and every candle that I ever got from a junior high birthday party. In my new apartment, not so much. I’m making a conscious effort to decorate with less clutter. Not only that, but I’ve tried really hard to focus on practicality over just about anything else. Let’s see how I did. Take a walk through my home and see how I decorated some of my primary surface tops. I have bolded all the important tips in case you don’t want want to read all the words. This pair of shelves is my ideal combination of practical and cute. First is the books. It’s always better to display your books, then box them up! Mine peek over the top of my desk, but I like it that way. You’ll see at the edge of the books is a festive mask from New Orleans, which is the only souvenir you’ll see on these shelves — I’m trying to limit the use of souvenirs as decorations to the really good ones. 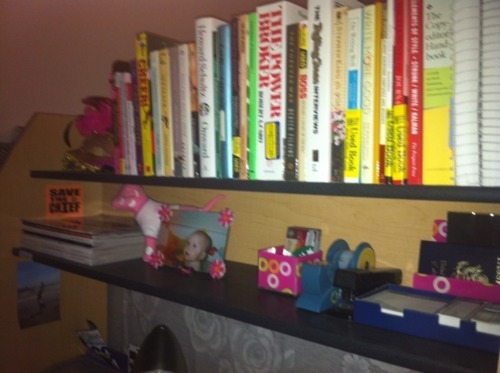 On the second shelf on the far left, you’ll see a stack of magazines. Putting those on that shelf was very much intentional. It’s so easy to collect old magazines and let them pile up. Those magazines are there so that my magazine collection is limited to that height. If I haven’t read the magazines on the bottom of that pile by the time I need to make more room for new ones, then I’m probably never going to read it and thus it’s not worth taking up space! You can also see my tape, stapler and sticky notes hanging out on the right. I like to have my office supplies easily accessible. Plus, my passport is in plain sight so that I can always find it. Since I rarely use it, keeping it visible ensures that I won’t lose it. (Is that a terrible idea? That’s a serious question.) 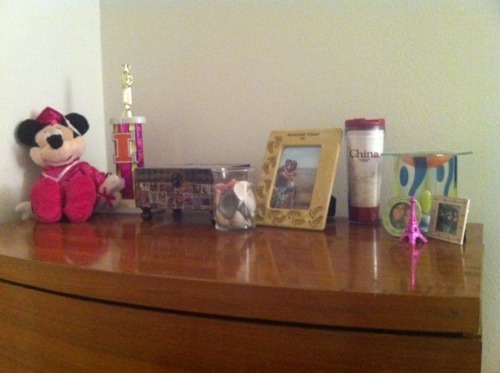 There’s a single picture frame and minimal trinkets. This is one of my shelves near my desk. 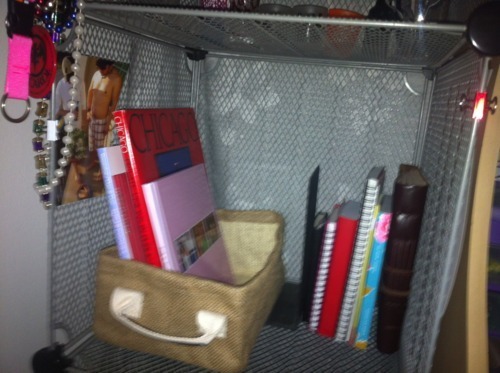 A good way to break up stacks of coffee table books and notebooks is to place some in/on different objects. In this case, I put some of them in a basket that I had left over from a Starbucks gift set. Another cute way to do this would have been to lay a few down horizontally with their spines facing out. Picture frames are great, don’t get me wrong, but I have a lot more pictures than I have room for frames. Sometimes, I like to use chunky paper clips to pin up a few photos in odd places, like the one on the left. This vanity was my grandmother’s, and now it is one of my favorite things in my whole apartment. I think it’s classic, pretty and incredibly functional. I put a lot of thought into decorating my vanity, because I wanted to keep the classical look to it, but I also wanted to make it my own. It’s the most “me” part of my whole apartment. Lighting here was a must, so I opted to use the lamp from my grandma as well, to keep the look consistent. The perfume bottle, however, is not practical at all. There’s hardly any perfume left in there, but the bottle looks pretty and was a modern version of something vintage. I liked that contrast. 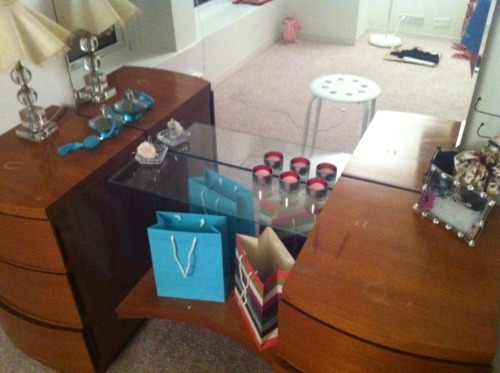 The pretty little piece on the glass shelf is a Waterford Crystal ring holder that I got from two very special people. The two lovely ladies that took me in as a volunteer at DSC while I was in college got me that when I graduated. I absolutely love it. Since this was my place that I’d spend time at every morning, I wanted to be surrounded by things that made me happy, which is why I keep that there. I topped that off with a darling floral hair clip that a Starbucks regular made for me back in Champaign. I like adding pretty little touches like that. 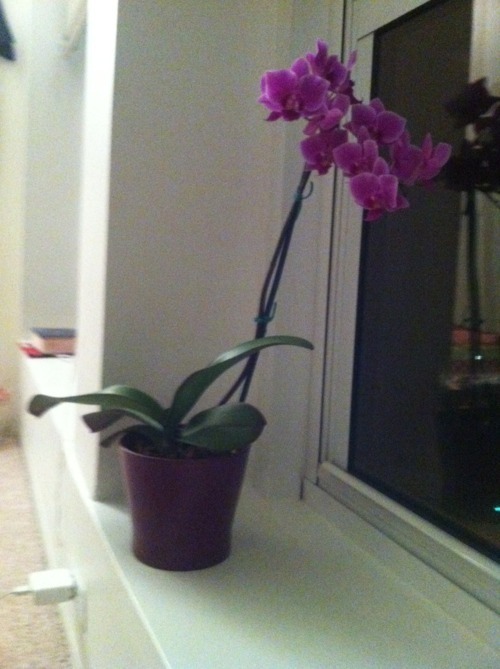 Since my vanity is the place where I go to look to pretty, I added a few extra pretty things to help secure that mood. I put a Coach and Tiffany bag on the bottom shelf, a few candles and a bodice jewelry stand to help set the tone. Looking pretty isn’t enough, though. Looking pretty is only the icing on a person who’s pretty on the inside. 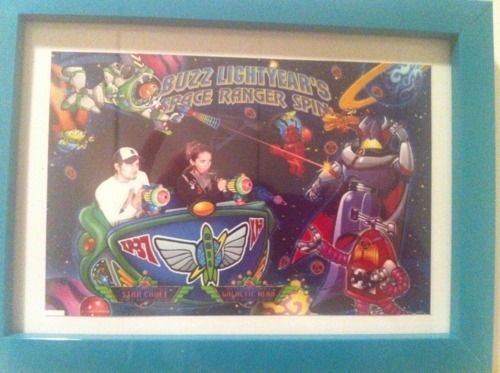 I have one picture frame here that means a lot to me. I took this picture in junior high of all the things that made me happy, along with a sign that reads, “Yep. She’s Happy.” A lot of things that made me happy then were superficial, like money and eyeliner, but a lot of them still make me happy today, like my friends and good writing. It’s important to have a constant reminder of what makes you happy. This is getting long, so I’ll make this one quick. Let’s try bullet points. A few pictures frames (one of the boyfriend and two of old friends from college). I like to keep picture frames to a minimum, and this is about my max. College participation trophy, which will obviously remain on display for the rest of my life as a constant reminder of my BFF. My mom bought me that jewelry box on Mom’s weekend in college and I’m absolutely obsessed with it. It’s practical and pretty — my fave combo! Displaying things people bring you from foreign countries is always acceptable. There’s a little bit of that up there. Love it! And then there’s some sea shells from Galveston … I guess you can’t win them all. If you want a child, get a plant. If you still want a child, get a puppy. If you still want a child, wait a year and re-evaluate. If you still want a child, then go for it. I’m clearly still at the plant stage. That’s all I got! I hope you liked some of my suggestions! Check back next Wednesday for how I decorate my walls! My current apartment isn’t my first apartment, but it is my first out-of-college apartment, which is an equally big deal. Unfortunately, that meant putting away my orange Christmas lights (which stayed up all year, of course), my pink satin comforter and my awesome (but tacky) liquor bottle collection (which was actually just a bunch of sticky bottles of flavored Smirnoff). Luckily, my first big kid apartment came with more than one closet, a doorman (fancy, right?!) and an actual pantry! And that liquor bottle collection? We just replaced it with an oh-so-fancy Goose Island bottle collection — moving up in this world! This is my biggest apartment to date at a whopping 1,000 square feet. More space means a few things. First, it tends to breed more stuff. 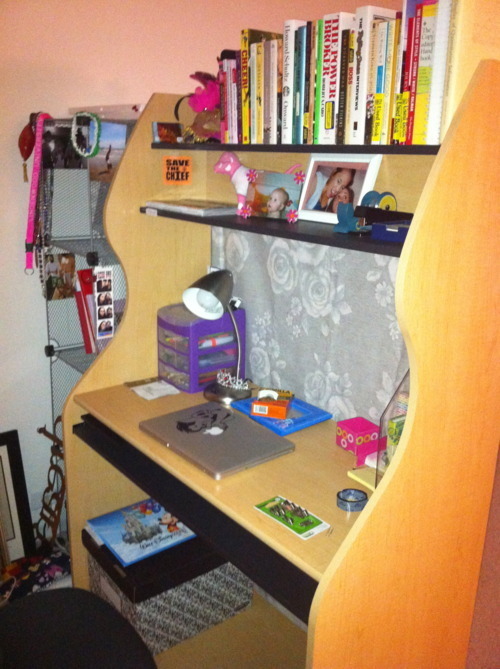 Second, it’s more area to decorate and organize. In my attempts to become a real person, I’ve tried to decorate my apartment accordingly — as in moving my shot glass collection to the cabinet, instead of the focal point of my bedroom. I’ve noticed that my interior decorating can be grouped into three very distinct categories. I’ll be sharing one with you each Wednesday for three weeks. I have a pretty big living room, but I don’t have a dinning room or an office. I didn’t necessarily need either of these rooms, since I can do work on my laptop from the couch and I’m perfectly capable of eating dinner at the coffee table. 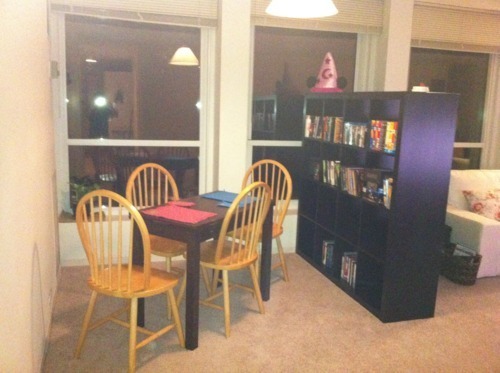 This comes back to to trying to be a grown up though, and grown-ups have kitchen tables, so I needed one too. This is the living room I started with. My goal was to add a dining area and an office area to the living room without taking away any of its utility. I wanted to have separate spaces, but not cut into the openness of the big room. 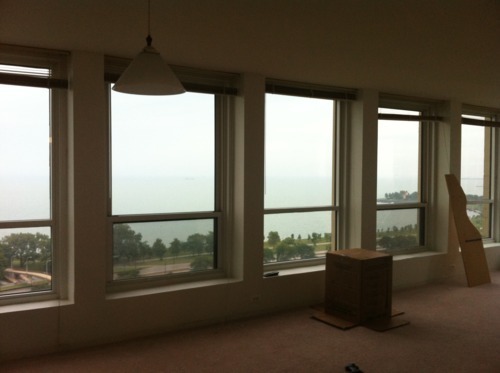 My living room is also lined with windows and capitalizing on our view was also really important to me. I created nooks that where open and airy, but definitive enough to set the room apart. They added more use to the room, but didn’t take anything way from it. The divisions are soft, instead of harsh borders, which allow the room the flow together. Purpose: All we really needed in our dining area was a table. There’s only two of us most the time, so we didn’t want a huge table, but we wanted the option to have a couple people over for dinner or lunch. 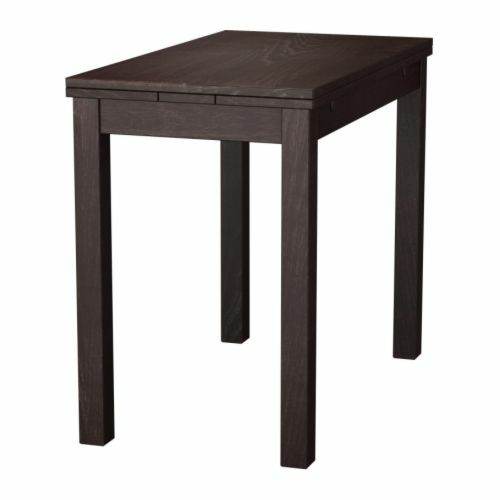 We picked out this table from IKEA which converts from a table for two to a table for four. Location: Like I said, we didn’t want to take away from the purpose of the living room, which, for us, was watching TV. So we needed the dining area to still have a view of the TV. The window view was also really important to me, so I didn’t want anything obstructing that either. We chose this corner, because it allowed us to meet both of our standards. Boundary: The next thing was how to set it off. I didn’t want anything obtrusive or harsh. I wanted the separation to be subtle and practical. 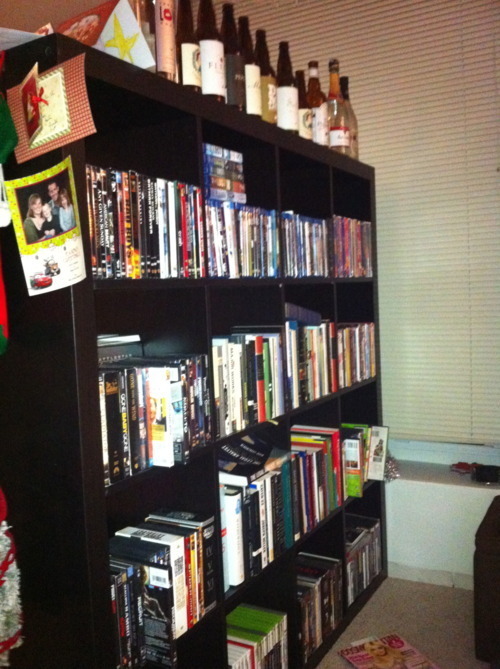 We chose this bookshelf from IKEA, which was absolutely perfect! The bookshelf was a great room separator because it was open from both sides, which made it was insanely practical. By using the bookshelf as a room divider, we could use the bookshelf from both sides, allowing for twice as much viewable storage space. Plus, by placing it perpendicular to the window, we hardly obstructed our lovely view. Purpose: The idea for my office nook is actually what inspired my love of nooks. I wanted to have an area for my office that could block out distractions. I didn’t want it to be visible from the primary spaces of the room, but I didn’t want it to be a dark and isolated corner either. I chose to put it in this corner for a few reasons. Location: By putting my nook here, the size of the living room hardly appears any smaller. The edge of the nook is parallel with the far edge of the room, which makes for a subtle cut into the room’s area. The windows were also really important in choosing the location. I wanted the natural light to help me stay alert and focused, but also to help create the sensation that my “place” was a nice little get-away. 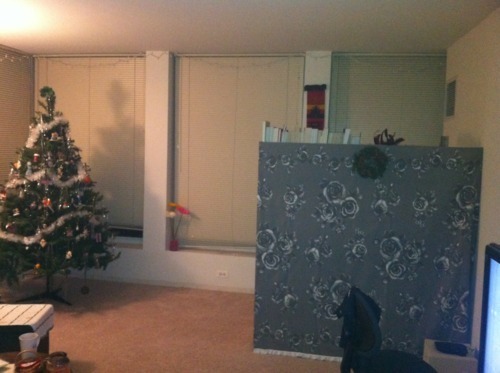 I also didn’t want to block the corner where both window walls meet, because that was the focal point of the room. Boundary: A tall desk made for a natural division for my office. It wasn’t quite that simple though. It started out with a simple, tall desk that I bought off one of my friends. To the left, you’ll notice some metal shelves. Since my desk didn’t have a lot of storage room, I needed the metal shelves to keep my office supplies, a few coffee table books and my Starbucks card collection. Also, you can tell that the back of my desk is open. That didn’t serve my purpose of creating an “office” free from distraction, plus it wasn’t very pretty. To solve this problem, I picked out some pretty curtain fabric from IKEA. It had to be thick enough to block out the light coming from behind it so you couldn’t see the silhouettes of all the stuff on my desk. 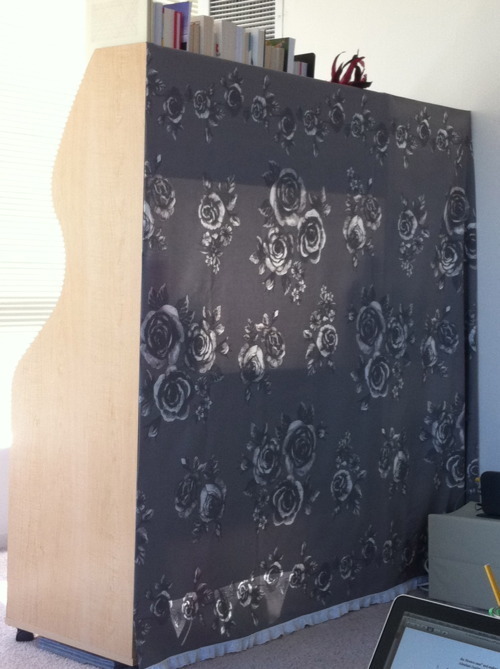 I used tiny nails to attach the fabric to the desk. The silver shelves were a little lower than my desk, so I had to get creative. I pulled the the fabric taught, and nailed the corner of the fabric to the wall so that from the living room it appeared to be one solid structure. I also added a little bit of lace to the bottom for some flair. Check back next week for Home Decor: Surfaces.